James Surowiecki of MIT's Technology Review has a long article on One Laptop Per Child (Part 1, 2, 3) that inflates Nicholas Negroponte's ego to even greater heights by comparing his OLPC Children's Machine XO project to Andrew Carnage's libraries. It's only too bad that the comparison fails in at least one major aspect: funding. While we'll politely overlook the aggressive robber baron methods Carnegie used to amass his wealth, at least he used that wealth to underwrite the majority of his libraries' costs. 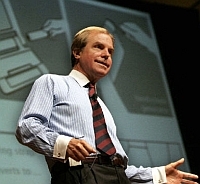 Nicholas Negroponte expects others to pay his entire $30 Billion dollars per year bill. "Others" he says are developing world governments, but might actually turn out to be unsavory or repressive states or developed world taxpayers. "We'd like to move five to seven million units in our first year," says Ethan Beard, a Google employee who sits on the board of OLPC. "That's already a pretty sizable amount of money. But eventually, we'd like to move 20 million units a year, which is $2 billion or more, and there are very few, if any, nonprofit institutions that could handle a project of that size." Apparently Ethan isn't so good in math. OLPC is talking about 200 million units a year, or $30 Billion dollars of laptops per year. And that decimal point really matters when you look at existing nonprofit organization sizes. The United Way, America's largest NGO according to Forbes, had a $3.8 Billion budget in 2005. The Bill and Melinda Gates Foundation, America's richest endowment, only has 31.9 Billion in total assets in 2006, including the first installment of Warren Buffet's gift. Brazil, for instance, which seems likely to buy a million laptops from OLPC as soon as they become available, has around 45 million school-age children: equipping all of them would cost something like $6.3 billion. Given the desperate poverty of many Brazilians, are laptops the best use for that kind of money? Even more so for $140, $208, $972 dollar laptops that hope for an implementation miracle. To answer James Surowiecki, Brazil currently has over $2 billion just sitting in a bank account called FUST (Fund for the Universalization of the Telecommunications System) which has just been accumulating over the past few years. Attempts to spend it one way or another have always run into problems so the money has so far just been used to make the budget look nicer. Earlier this year MEC (the education ministry) set aside $100 million for a project to create 2000 computer labs in schools around the country. Each lab has to have at least 10 PCs. Obviously most will have more, but it goes to show you how much money is routinely spent on this kind of thing and how little we normally get in return. So I can't get myself worked up about a $6.3 billion total cost to give each child a machine. And having dealt with my share of total computer newbies, both adult and children, I would say a training budget of $0 per child is about right. We only have to worry about the teachers, and that is mostly because they will be too proud to learn from the kids. I wonder how many have to die, before "my own and your" (for most readers, elected politicians) "decides for a change". "I for one", think this alone, is a damn good reason for supporting this project. I would gladly pay more taxes for these kind of things. Besides, is it about "education"? Not a tool, if we want a humane world, where we all recognize the fact that we only have one planet? Giving it a real shot to build a humane one. Btw, Im still in denial regarding the name change.. Needles to say, IM PISSED. give students full day education, transportation and food. For a country like ours to spend our scarce money in this these laptops is ridiculous. By that, I mostly want to stress the issues how "we" (If I take my own country, Sweden as an example) _have_ and how "we" _today_ deal with for example environmental issues or our indigenous people, Sami, the Lappish culture rights to reindeer pasture land or how "we", treat Roma people. We are looking more and more homogeneous both in cultural sort of way and the "quilts of crops" on the planet. Thats both sad, and not good for any of us. However the beauty of this project is in the "rollout", lying in the "small" things that improve self-care in number of ways and by that saving lives. Which, could most likely be the outcome of project like this. And especially combined with other forms of aid that works in a similar way, by _empowerment of the common person_. In any case, it leads too more dialog between people and that's a good thing. I can't see why this would be ridiculous, for people like me who is a Swedish tax payer, to support it. Especially when I can afford it. Even though I pay my own taxes to my own country as all citizen should do, for example to the areas that you mention. However for people who can't afford it, as you say, _that is really ridiculous too say the least_. But I can't see why a person like me, wouldn't or should not have the oppertunity to contribute my part that I can to a project like this, when it benefits not only by the "end-user", but our common biosphere, the world. Fernando, I don't mean this as.. some sort of personal critizism or anything like that, it's just a elaboration of my previous post and pointing out that my english isn't that good. Im not related to OLPC, in other way that I see, as many others, the possibility with "this" tool. Regards /D. Fernando, this kind of objection has been repeated since the Educom project in the early 1980s and is known as "síndrome da merenda escolar". While the idea that some school in Porto Alegre shouldn't get a projector while a whole class in Francinópolis went all day without a meal sounds noble, that isn't how government budgets work. If you cut the resources for space research in half, the money won't end up financing popular housing. You can't divert the millions flowing into FUST to beef up "Fome Zero". I have been a teacher myself and know quite a few who still are, so I am very familiar with the frustrations of lack of money. But looking at the educational system in the US I can see that in many situations just increasing spending on current items can often have no (or even a negative) effect on the quality of education. That is counter intuitive but often how things work in the real world. To put my position further in perspective, I should mention that I am developing a competing project to the OLPC (started in 1999) and you might imagine how much harder it will be for me to sell low cost computers for children when they are getting one for free from the government (not counting all the taxes I will be paying and they won't). So it isn't like it doesn't cost me anything to support them! Daniel, I appreciate your goodwill and generosity, and recognize your best intentions. But the situation in Brazil is far different from Sweden, and I'll try my best to explain my point. Shall we cut funding from teacher education programs? Shall we reduce teacher salary (already ridiculously low)? Shall we cut the child labor erradication program? Shall we forget the large number of children who are out of school due to lack of facilities and lack of transportation? I could go on forever. Mr. Negroponte is offering us something that should not even be in our priority radar. And want us to pay. Thanks, but no thanks! The whole question is not where to cut, but rather how to reroute funds. A teacher's decent pay, a full-day class, food and transportation are all good debatable issues, certainly with immediate results. But alone or together, they will not solve the Education's Gordian knot. In Brazil or elsewhere. We like to think on instant values and results; we are not used to think even for a split second about decades. Education IS a long-term issue. Period. The Education principles, adopted in most public schools are not much different from those used in the beginning of 20th century. A real, concrete, and radical revolution in Education is what we need. The X0 laptop is, imho, a good start.